A man and a woman are talking in front of well, a fountain or a simple spring. In the Orient at that time, wells and fountains were similar and wells with lips and wheels to draw water did not exist. But artists do not trouble themselves with archaeology and often depict them after the models they are familiar with. The image of the fountain goes well with the meaning of the text. The characters’ positions can vary. Jesus is sitting on one side and the woman is standing with a jug on the other side. 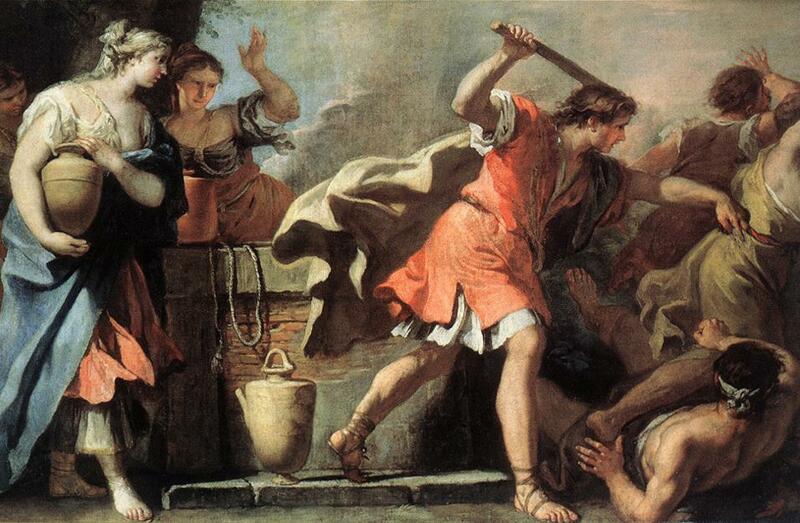 Or else Jesus and the woman are standing on each side of the well or of the fountain. Jesus standing and the woman sitting are seldom represented. In any case, they are talking and the Samaritan woman seems curious about what Christ tells her. The scene takes place in Samaria and, in the distance, can be seen the city, with the apostles coming out of it and approaching their master. Rebecca and Eliezer; Bartolomeo MURILLO; c. 1650; oil on canvas; Museo del Prado, Madrid. watering Eliezer’s camels for they are in front of a well, too. Isaac, Abraham’s son, wants to marry and his father sends his servant Eliezer to fetch a spouse in the land of his ancestors. The maiden who shall offer water to him and his camels shall be the right one (Genesis 24). 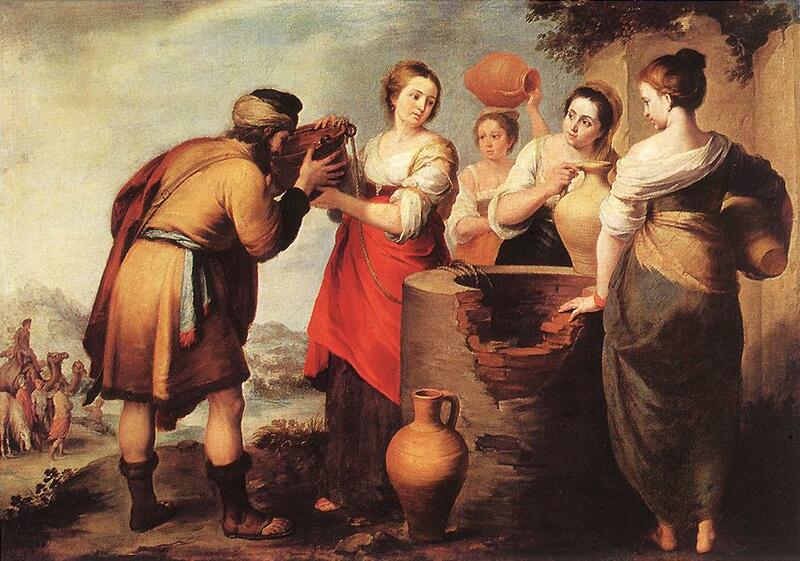 The scene distinguishes itself in several ways: Rebecca is younger than the Samaritan woman, she is at the well with her female companions, Eliezer is surrounded with servants and camels. This scene is represented quite frequently. the meeting of Moses with Jethro’s daughters. Moses who has fled to the desert after killing an Egyptian arrives near a well where maidens water the cattle of their father Jethro. But some shepherds want to prevent them to do so and threaten them. Moses intervenes to chase them. Moses will marry one of them, Cippora (Exodus, chapter2). The scene is often violent, the text being sometimes understood as an attempt at theft. This picture is rather rare. The Gospel according to John, chapter 4. Jesus arrives at a city in Samaria; he has a rest near a well while his disciples go and buy something to eat. There came a woman of Samaria to draw water: Jesus said to her : "Give me a drink." Then the woman of Samaria said to him, "How is it that you, being a Jew, ask a drink from me, a woman of Samaria? for the Jews have no dealings with the Samaritans. Jesus answered and said to her, : "If you knew the gift of God, and who it is that says to you, Give me to drink; you would have asked him, and he would have given you living water." The woman said to him : "Sir, you have nothing to draw with, and the well is deep: from whence then have you that living water? Are you greater than our father Jacob, who gave us the well, and drank from it himself, and his children, and his cattle?" Samaritans were also Hebrews respecting the Law of Moses but separated from the Jews for centuries they had no longer any contact with them. By revealing himself as the Messiah to a woman from Samaria, Jesus manifests his nonconformity and criticizes Judaism. A personal dialogue between Jesus and the woman from Samaria. 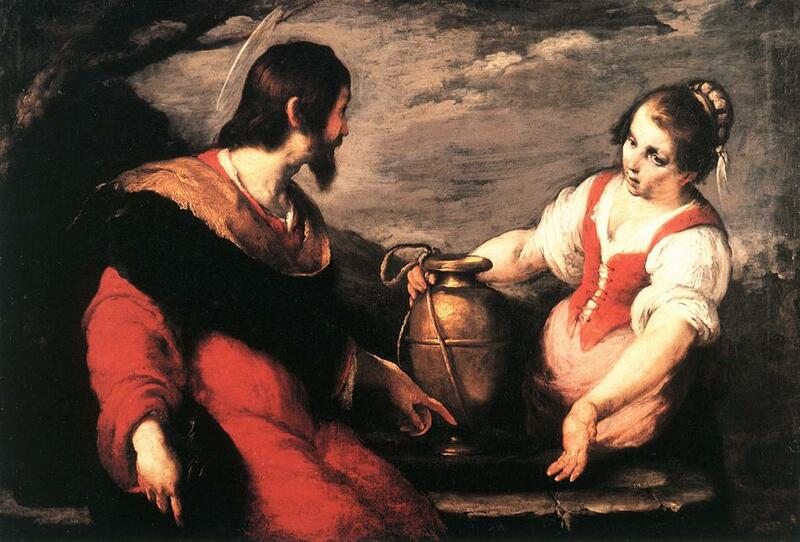 Christ and the Samaritan Woman; Bernardo STROZZI; oil on canvas; Honnema Foundation, Heino. A scene with the return of the disciples. 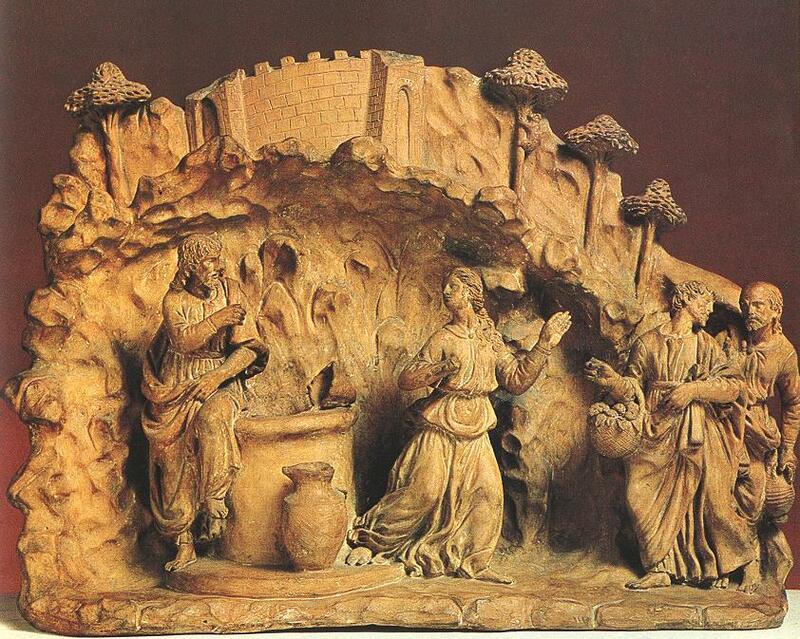 Christ and the Samaritan Woman; Benedetto da MAIANO; terracotta; Museum of Fine Arts, Budapest. Different contexts: on the left, the woman is quite Flemish but the higher part of the well recalls the gibbet and the cross; on the right, the scenery is more antique. Is this the reason for the Samaritan woman’s nakedness? Christ and the Woman from Samaria; Juan de FLANDES; 1496-1504; oil on wood; Musée du Louvre, Paris. Christ and the Samaritan Woman; George RICHMOND; 1828; tempera on wood; Tate Gallery, London. that gives life is not only biblical but universal; which explains that springs have often been sacred places and that apparitions or divine manifestations are linked to them. The most famous example is the spring at Lourdes in France where Bernadette Soubirous saw an apparition of the Virgin Mary in 1858 and where, every year, thousands of pilgrims come and pray while sick people are plunged into the spring. was the name given to a big pump placed on the river Seine at the entrance of the Pont Neuf (“New Bridge”). This pump was demolished towards 1830 but the name was taken up by a department store that was close to it; this big store was closed down in 2005. The pump "the Samaritaine" seen from the Pont Neuf, 18 th c..